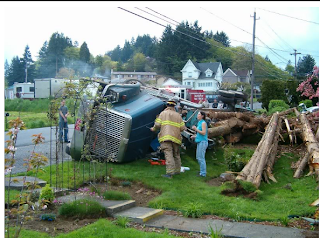 I've recently created a page on my blog dedicated to sharing about our families very unique experience of having a log truck, loaded with cedar logs, crash into our home and yard. Enjoy the story, it sure was an adventure for us! That looks like it was scary! I can't imagine what it felt like seeing that truck coming towards your house like that. Thankfully no one was hurt. Opps- didn't mean to delete my comment! Wow- so glad no one was hurt! I hope you at least get some of that good cedar wood! I'm think'n a nice cedar deck or fence would be nice...maybe a few very large flower boxes...not to mention the house! I mean really what are the chances! I hope everyone is okay. I bet there was a huge mess to clean up! I never feel myself comfortable driving close to big trucks! What a disaster! They were supposed to plant a new garden for you!